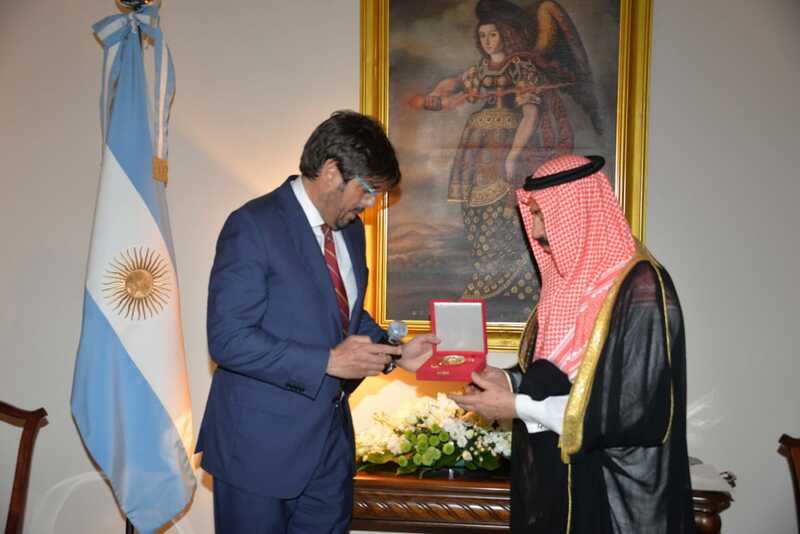 The government of Argentine Republic has awarded “Orden de Mayo al Mérito en el Grado de Gran Oficial" award to the president of the Saudi support group for Malvinas Islands, Dr. Haitham Bouzo in appreciation and recognition of his efforts in supporting the Malvinas Islands Question. 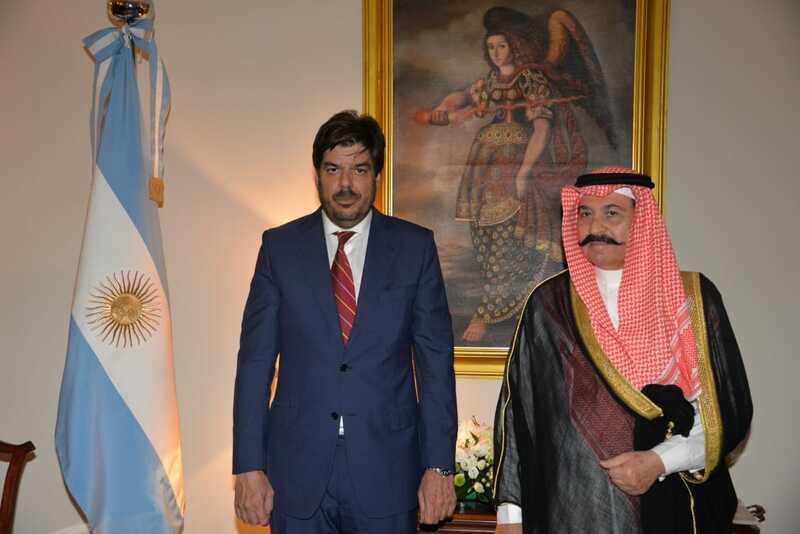 The graceful award ceremony was held at the residence of the Argentine Ambassador H.E. Mr. Marcelo Gilardoni in the presence of Argentine embassy, Malvinas Saudi Support group officials, media representatives, and special guest. Ambassador Gilardoni reads out the Argentine’s government’s message for Dr. Haitham Bouzo, praising his efforts for the support of Malvinas Islands Question followed by the presentation of the “Orden de Mayo al Mérito en el Grado de Gran Oficial" Award to Dr. Bouzo. Speaking on the occasion Dr. Bouzo has said, “I am so honored and humbled to be here tonight and grateful to be the recipient of this award on behalf of the Saudi support group in supporting the Malvinas Islands Question. The fact remains always that LAS MALVINAS SON ARGENTINAS. It is a great honor and privilege, so thank you the Argentine people and the Argentine government, “He said. The Question of the Malvinas Islands is a priority issue of the Argentine foreign policy, reflected on a constitutional mandate and expressed as a state policy that binds all the Argentine people. Since the islands were seized by force by the British in 1833, expulsing the legitimate Argentine authorities and populating the islands with its own colonizers, Argentina has claimed to recover its full sovereignty over these territories, in accordance with International Law and respecting the way of life of the people of the Malvinas Islands. It is the conviction of the Argentine Government that the matter can only be solved peacefully by bilateral negotiations with the Government of the United Kingdom. This is the reason for which, at the multilateral level, the Argentine Government continues to reaffirm its legitimate sovereign rights over the archipelagos and maritime spaces in dispute, urging - with the support of the international community - the United Kingdom to resume the negotiations that will allow finding a peaceful and definitive solution to the controversy. During the last years, President Macri has relaunched the relationship with the United Kingdom in a variety of aspects, including -under the sovereignty safeguard formula- those related to the South Atlantic. In this last aspect, a substantive and constructive dialogue has been promoted with the intention of identifying areas of mutual interest, seeking to generate the climate of confidence necessary for the resumption of the negotiations on sovereignty. In this sense, a wide variety of mutual interest actions have been approached between the two governments ever since: 1) The facilitation of the International Committee of the Red Cross (ICRC) in the initiative to identify the remains of the Argentine soldiers buried in the Darwin cemetery, Islas Malvinas, under the legend "Argentine soldier only Known by God; 2) The resumption of scientific cooperation for the conservation of fisheries resources in the South-West Atlantic, holding a meeting on May and November 2018 of the Scientific Subcommittee of the South Atlantic Fisheries Commission in Buenos Aires and London, respectively; 3) Furthermore, in order to promote greater connectivity of the Islands with the Argentine mainland and to intensify the links between the continental Argentines and the inhabitants of the islands, in November 2018 the Governments of the Argentine Republic and the United Kingdom reached an understanding so that the LATAM company operates an additional Malvinas Islands air service (to the existing Punta Arenas / Río Gallegos / Islas Malvinas service), departing from the city of San Pablo (Brazil), with two monthly stopovers in the argentine city of Cordoba.